Role of the Mediterranean Diet in the Brain and Neurodegenerative Disease provides a comprehensive overview of the effects of all components of the Mediterranean diet on the brain, along with its beneficial effects in neurodegenerative diseases. It covers topics on neurodegenerative diseases (Alzheimer disease (AD), Parkinson disease, (PD) Huntington disease (HD) and Amyotrophic Lateral Sclerosis (ALS), also providing information on how cardiovascular disease, Type 2 Diabetes, and Metabolic Syndrome become risk factors for neurodegenerative diseases. 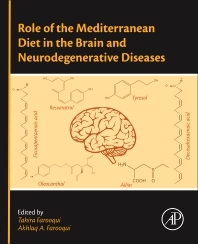 This book focuses on how the Mediterranean diet suppresses oxidative stress and neuroinflammation in neurodegenerative diseases as well as signal transduction. The Mediterranean diet is characterized by the abundant consumption of olive oil, high consumption of plant foods (fruits, vegetables, pulses, cereals, nuts and seeds); frequent and moderate intake of wine (mainly with meals); moderate consumption of fish, seafood, yogurt, cheese, poultry and eggs; and low consumption of red meat and processed meat products. High consumption of dietary fiber, low glycemic index and glycemic load, anti-inflammatory effects, and antioxidant compounds may act together to produce favorable effects on health status. Collective evidence suggests that Mediterranean diet not only increases longevity by lowering cardiovascular disease, inhibiting cancer growth, but also by protecting the body from age-dependent cognitive decline. 7. Mediterranean diet and dementia: Can this be a preventive approach? 21. Mediterranean diet is beneficial: But, how and why? 27. Importance of fruit and vegetable-derived flavonoids in the Mediterranean diet: Molecular and pathological aspects. 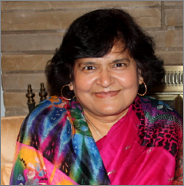 Tahira Farooqui has published extensively on drug receptor interactions, biogenic amines in vertebrate and invertebrate nervous systems, biogenic amines mediated signaling, neural plasticity, as well as neuromoulatory roles of octopamine in the reinorcepathway involved in learning and memory, glycerophospholipid and sphingolipid metabolism and molecular signaling mechanisms in the brain. She is the author of 65 peer-reviewed research articles, one monographs and 8 edited books. She has coauthored a monograph in 2008 Metabolism and Function of Bioactive Ether Lipids in the Brain, 2008, by Springer, and have edited 8 Life Sciences books:1) Biogenic Amines: Pharmacological, Neurochemical, and Molecular Aspects in CNS, 2010, NOVA Science Publishers; 2) Phytochemicals and Human Health: Pharmacological and Molecular Aspects, 2011, NOVA Science Publishers; 3) Molecular Aspects of Neurodegeneration and Neuroprotection, 2011, Bentham Science Publishers; 4) Oxidative Stress in Vertebrates and Invertebrates: Molecular Aspects of Oxidative Stress on Cell Signaling, 2012, John Wiley & Sons, Inc; 5) Beneficial effects of propolis on human health and chronic diseases. Vol I, 2012, NOVA Science Publishers, Hauppage, New York; 6) Tahira Farooqui and Akhlaq A. Farooqui, Beneficial effects of propolis on human health and chronic diseases. Vol II, 2012, NOVA Science Publishers, Hauppage, New York; 7) Metabolic Syndrome and Neurological Disorders, 2013, John Wiley & Sons, Inc.; and 8) Diet and Exercise in Cognitive Function and Neurological Diseases, 2015, John Wiley & Sons, Inc.
Akhlaq A. Farooqui is a leader in the field of signal transduction, brain phospholipases A2, bioactive ether lipid metabolism, polyunsaturated fatty acid metabolism, glycerophospholipid-, sphingolipid-, and cholesterol-derived lipid mediators, glutamate-induced neurotoxicity and modulation of signal transduction by phytochemicals. He has published more than 200 hundred papers, authored 11 monographs: Glycerophospholipids in Brain: Phospholipase A2 in Neurological Disorders (2007); Neurochemical Aspects of Excitotoxicity (2008); Metabolism and Functions of Bioactive Ether Lipids in Brain (2008); and Hot Topics in Neural Membrane Lipidology (2009); Beneficial Effects of Fish Oil in Human Brain (2009); Neurochemical Aspects of Neurotraumatic and Neurodegenerative Diseases (2010); Lipid Mediators and their Metabolism in the Brain (2011); Phytochemicals, Signal Transduction, and Neurological Disorders (2012); Metabolic Syndrome: An Important Risk Factor for Stroke, Alzheimer Disease, Depression (2013); Inflammation and Oxidative Stress in Neurological Disorders (2014); High Calorie Diet and the Human Brain: Consequences of Long Term Consumption (2015); Therapeutic Potentials of Curcumin for Alzheimer Disease (2016). All monographs are published by Springer, New York. 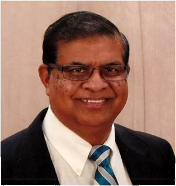 Akhlaq A. Farooqui has edited 10 books published by Wiley Blackwell Publishing Company, New York; Nova Science Publisher, New York; Bentham Science Publishers, Dubai, and Elsevier, San Diego, CA.